I’ve just pre-viewed a chilling TV doco, Shadow of Doubt, about justice in Australia: a woman is serving 23 years in jail for a murder – which in my opinion – she didn’t commit: she has 19 years to go. Foxtel is screening the 80-minute documentary for the first time nationally tomorrow (31 July 2013) on its CI (Crime and Investigation) Channel 617. The film’s cinema premiere is the same night at Hobart’s State Theatre, with a Q&A-style panel debate to follow, involving doco writer/producer Eve Ash, pro bono lawyer on the case Barbara Etter, and barrister Greg Barns. The film will play at festivals here and worldwide, and at selected venues throughout Australia. No body, no murder weapon, no believable motive, no confession, a head-shaking jury verdict, and inexplicable comments in the judge’s sentencing…‘Shadow of Doubt’ will change your opinion of justice in Tasmania and in Australia, in my opinion. I agree. Melbourne producer-director Ash, a psychologist by profession, clinically peels away layer after layer of seeming injustice with deft interviews, shredding police attitudes and prosecution allegations in court. The documentary is a work of art and a forensic probe, edited with a surgeon’s precision. It is finer and more balanced, apparently, than much of the evidence produced by police and in court. The guilty party appears to be not the woman in jail, but “the system”. Tasmanian justice is on trial, but this travesty could happen anywhere in Australia, I believe. It could be you or me in place of the imprisoned woman: this film suggests we are all just an errant witness or two, and a befuddled memory, away from a jail cell, even when innocent. Outside the film preview, I’ve had the chance to research aspects of this case for the past six months. The film appears to be a fair and accurate summary of what happened: along with new information, it helps expose a major miscarriage of justice. The Yacht No Body case began on Australia Day, 26 January, in 2009. Bob Chappell chose to stay overnight aboard the newly-bought 17m (53ft) yacht Four Winds to work on the yacht’s electrics (a powered anchor winch had failed 24 hours earlier). His partner/wife of 18 years, Sue Neill-Fraser, was to pick him up in the yacht’s dinghy early next morning for work. He was the chief radiation physicist at Royal Hobart Hospital, responsible for managing life-saving Xray, ultrasound and MRI scanning machines. About 5.30am on 27 January, early-morning rowers noticed the yacht’s dinghy floating just offshore. About 450m further out from the Sandy Bay foreshore, the yacht was heavily bow-down, half-sunk on its mooring. There was nobody on board. Bob Chappell had disappeared. The documentary reveals the tragedy of what ensued. What followed immediately that January morning was pure Keystone cops. Marine police, fire brigade and a marine workshop crew responded and used heavy portable pumps to save the yacht. Twenty or so people, including general duties Tasmanian police, trampled all over possible evidence on and in what might have been a murder scene. They moved ropes, opened hatches, closed a seacock, shuffled tools, shifted floorboards, removed and replaced steps, left their own plastic sustenance containers around…and one police person walked on a large cook’s knife lying on the wheelhouse floorboards. That’s right, a policeman walked on a large knife lying on the floor at the scene of someone’s disappearance, possible murder. TasPolforensics later identified the boot marks as belonging to a police-issue boot. It seemed somebody had sabotaged the yacht overnight. A plastic pipe running into a toilet area was cut or hacksawed through, apparently triggering the sinking. An opened seacock was allegedly contributing to the inflow. Chappell is still missing. Police took seven months until August 2009, to charge Neill-Fraser. She was refused bail. The state took more than another year to put her before court. She had served 13 months in jail before getting the chance to say “Not guilty”. Looked at from every which-way, Neill-Fraser has had rough justice from the start, in my opinion. Basically, ignoring precise legalities, I believe the Tasmanian police had decided she was guilty, on suspicion and maybe on dislike for what she represented (see later). On their say-so, the local justice system decreed she was guilty enough to keep locked behind bars for more than a year before trial so that preparing her defence was hampered. In Tasmania, innocent until proven guilty does not apply, even though the state’s Bail Act formally says that it should. For some reason, Tasmanian judges won’t give people bail on major offences like this one: it seems you have to prove you are innocent before you are allowed to be free, which is the opposite to how the rule of law is meant to work in Australia. About halfway through police investigation, the Director of Public Prosecutions apparently told the police they didn’t have a strong enough case to convict Neill-Fraser. The police went out and bolstered their case. The doco slices away at doubtful “facts” blessed by being called evidence when produced in court and promoted by police in media leaks and public commentary. In my opinion, the film suggests that, in and out of court, there might be reason to consider the police were at various times slack, wrong, selective, devious, and possibly even biased if a police linguistic slip in the film is as indicative of police attitude as I think it may be. Slack: they failed to immediately follow up dinghy sightings and reports of allegedly suspicious-looking people seen on shore; witness statements were not taken in detail for over six months; four other sightings of apparently the same dinghy tied alongside the yacht in mid-to-late afternoon, distinct from the yacht’s own dinghy, were glossed over. Wrong: in statements to the media, police claimed Neill-Fraser had looked up a website on ‘how to declare someone dead’ within days of Chappell’s death. But a non-police forensic examination showed the search – which had been carried out on the ‘Guest’ account on the home computer, not Neill-Fraser’s personal account – was about how to comfort a child distressed by an adult’s death and a website relating to issues concerning deaths in the UK and Wales. One of Neill-Fraser’s daughters had apparently been seeking online help to explain grandad’s disappearance to her own young child. Selective: the documentary claims police chose to not record a statement – even though they had “informally” interviewed the witness – from at least one woman who would almost certainly have caused serious doubt about the credibility of a key police witness, and hence probably trashed a core plank of the police/prosecution case. Devious: police adopted a technique which amounted to ‘tricking’ people into comments on half-shown items and images, and therefore into changing their memory of times things happened, for example. There is a lingering suspicion raised by the documentary – but so far unable to be verified – that a key witness may have benefited from police ‘going easy’ on charges against him (including possessing many hundreds of rounds of ammunition). The witness in the Neill-Fraser trial, who was crucial to the police case, was discharged without conviction and fined $20 for the victims’ fund in circumstances where the court penalty could have involved serious jail time. “Duplicity”: here lies the least-provable, but possibly the most crucial, aspect of how the Tasmanian Police attitude may have colored the investigation from the outset, therefore shaping the prosecution performance and skewing even judicial rulings and the ultimate sentence. “Yes. I mean, you have a fairly good picture of my social background from my voice, and I of yours. We’re branded on the tongue,” he says in what one would indeed hazard were the beautifully modulated tones of of an ex-public schoolboy (‘public’ in England meaning ‘private’ in Australia – BR). Watching the documentary, this newspaper observation suddenly flooded back to me. Printed newspapers don’t do voice. You need a vibrant, active, first-person film documentary like Shadow of Doubt to reveal possible hidden nuances. The power of this doco is that the players speak their parts: they reveal attitudes as much as “evidence”. In an interview early in the film, a policeman is asked a question. He answers by talking about “Sue Fraser”. The woman, hunted down, convicted and imprisoned is called Sue Neill-Fraser, not Sue Fraser. Neill-Fraser was her maiden surname: her mother is called Helen Neill-Fraser. Sue Neill-Fraser reverted to her maiden name after a first marriage to Brett Meeker ended. Some years later, 18 years before the events of 2009, she met and formed a strong and loving partnership with Bob Chappell. I don’t know the answer, but the documentary leaves many doubts that the woman ever got what we lay people would call a fair go from the police. Nothing she said was ever believed, everything anyone else said contrary to her cause was elevated to gospel truth. For example four yachtie workers from Queensland, who had known the couple for mere days spread over the previous few months, claimed in statements to police that she had “left” Bob Chappell. This ignorant opinion was elevated above what her family and friends knew about the Bob-Sue relationship because they had lived intimately with it for many years. A highly-qualified close observer of the case, with a name well-known in Tasmania, told me: “Sue Neill-Fraser never had a chance. The police were out to ‘get’ her…and they did”. Neill-Fraser was brought up partly in England, and partly in “good” schools in Australia. She speaks with a cultivated Australian accent. It would be a tragedy if a double-barrel surname, speaking the Queen’s English, and half-owning a yacht was criminal enough to put someone initially in the frame for murder. And then to have that frame become the cold, hard bars of Risdon Prison in Hobart where she nowadays tends a vegetable garden and helps younger female prisoners who haven’t enjoyed the quality of education she received. The police concentrated on Neill-Fraser as the probable killer within days of the disappearance: they almost instantly examined her bank records. Listening devices soon installed in her home eventually racked up more than 600 hours of tape: there were 1200 photographs, some taken during covert surveillance. Nothing was left undone to prove a police theory correct. There was apparently – from a study of the police investigation log – no commensurate concentration or effort on following up leads which might point to her innocence. The police never seriously suspected anyone else, that was obvious, despite clues scattered far and wide that several other people may have committed a crime…if, that is, Chappell didn’t have too much to drink, fall overboard and drown, in the middle of trying to repair a toilet connection, which is still a possibility. There was DNA found on the deck of the yacht, belonging to a homeless girl who denied ever being aboard. Homeless people were reported to have been camping in cars on the nearby foreshore, and stealing rides in dinghies. One of Chappell’s adult daughters, who suffers from a mental illness, communicated directly and indirectly a weird premonition to at least three people in the hours before Chappell disappeared that he would be in peril. She was apparently fixated on herself and her father sailing away together to avoid “the trouble”. The DNA of Chappell’s son was found on a glove on board the yacht (and wrongly claimed in court by the DPP to be the DNA of Neill-Fraser – see below). Since first watching the doco, I have read the transcript of the trial in the Supreme Court of Tasmania, seen the photos shown in court, and become privy to mounting newly-analysed data and further reports and evidence. The new material shakes the foundations of the conviction to its core, so far as I am concerned. But it was not only poorly-interpreted evidence that put Neill-Fraser behind bars: some people who sat through the trial question whether just being female was a major disadvantage. Someone who observed virtually all the trial asked, what does the fact that the yacht club served pies for lunch some days have to do with a murder charge? But the menu at the yacht club was part of that extended line of questioning of Neill-Fraser. I wonder whether a man on a murder charge would have been asked a similar question? “She seems to me to be clever, very cool-headed, and well able to control her emotions,” Blow J said. Observers say that the accused woman made the mistake of not breaking down and crying in court: had she done so, who knows what the result might have been. Juries and judges are only human. The case included alleged overtones of possible use of the yacht for drug smuggling in Queensland before it was bought by Chappell and Neill-Fraser. On the very day the jury retired to consider its verdict, a huge drug bust ($160m of cocaine, the third biggest in Australia’s history) took place at the marina in Queensland where the Four Winds had spent 18 months, and where Chappell and Neill-Fraser had recently inspected and bought it. There had been a belief, by more than one person, that the yacht may have been surreptitiously entered after they bought it, and again in the mooring in Sandy Bay. But the jury was not told of the drug bust: they had retired to consider their verdict the very day the police raid was splashed all over national print and TV media. They were not told anything about the drug bust, even that the same raid included a wider sweep which uncovered a clandestine drug laboratory at Eden in NSW: the Four Winds stayed overnight in Eden on its way from Queensland to Hobart in December 2008, just weeks before the mysterious disappearance of Chappell. Aspects of how Neill-Fraser was treated by police, in the witness box, and in sentencing raise the question of whether misogyny, aired so frequently recently by former Prime Minister Julia Gillard, played a part. The sentencing to a devastatingly long 26 years jail by Justice (now Chief Justice) Blow is not easily understandable in relation to its severity. 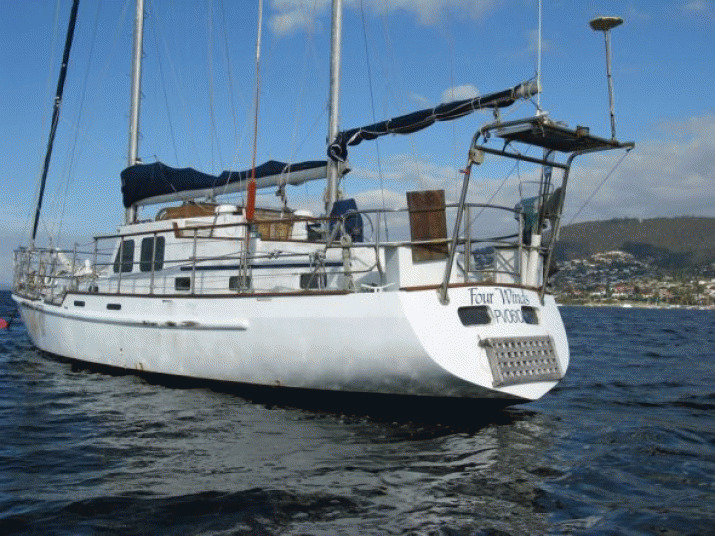 Some interstate yachties who were visiting Hobart at the time of the disappearance – lawyers – who followed the case closely, have said they found the sentence “gobsmacking”. On appeal, the sentence was reduced to 23 years, with a 13-year non-parole period. Had the original sentence been 12-15 years, which was within the range of possibilities, it might have been reduced to 8-10 on appeal, with perhaps seven behind bars. But because it started at the high end of the range, the reduced sentence ended high. I hope these remarks don’t spoil the doco for you. I think it should be seen by every Tasmanian, every Australian in fact. The documentary is chilling. You may start to shake your head in disbelief before 10 minutes pass. How the cards were and are stacked against Sue Neill-Fraser may stun and numb you. If you are like me, you will replay the injustice in your mind as your head hits the pillow. When you recall the doco’s evidence of dinghies, your mind will see dingoes, Uluru and Lindy. How Sue Neill-Fraser has been abused – in my opinion – by “the system” will continue to haunt you days, weeks, and months later, as it does me. She could be any one of us, and any one of us could be her, when justice goes feral. * Bill Rowlings OAM is Chief Executive Officer of Civil Liberties Australia. His sailing experience includes the Sydney-Hobart race and skippering a 16m yacht from Egypt to Australia. He and CLA are campaigning for law recently passed in South Australia – the ‘Right to Appeal’ – to be ‘mirrored’ in Tasmania and all other Australian jurisdictions. It gives people who have exhausted their appeal process a chance for a judicial review if more and better information becomes available about their case. I’ve seen all three of these three appeals court judges in action. Let’s hope any perversion of justice in this case isn’t so gross and comprehensive that a higher court wouldn’t hear it for fear of bringing the judicial system into disrepute. But I’m not confident. This case highlights the need for an urgent review process where any decision that is clearly questionable can be assessed properly and independently. The web of omissions, blunders and so-called “facts” dressed up as evidence are horrifying. To think that this could be happening in Australia in the 21st century is incredible. I seriously wonder what the law schools, universities and police academies are teaching their students? People trust our police, our lawyers and our courts – a miscarriage of justice such as Sue Neill-Fraser’s case should make every Australian question that trust.